Have you made a crustless quiche? When I’m making quiche, I typically choose potatoes over a traditional flour crust, but this time, as I started the quiche, I realized I was completely out of potatoes. (I’m not even sure when that happened last, because this family is serious about their potatoes!) I decided to go ahead and try the quiche with just the fillings and it turned out great. I served this for dinner with a simple strawberry and spinach salad for a light and filling meal. My husband raved about this meal and very happily claimed the last piece for his breakfast the next morning. 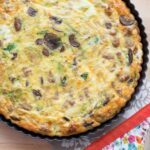 One of the best things about quiche is the way it is completely adaptable to so many different tastes. I loved the way this one turned out with a combination of brussels sprouts and mushrooms, but just about any vegetable will work for this meal. Simply substitute 3 cups worth of your favorite vegetables and enjoy! Preheat the oven to 400 degrees. Cook and crumble the sausage in a large skillet over medium high heat. Remove the cooked sausage to a paper towel lined plate and drain all but a teaspoon or so of the grease. Add the onions to the hot skillet and toss to coat. Saute, stirring just a few times, until they are tender and lightly browned, about 5 minutes. Add the mushrooms and brussels sprouts. Sprinkle with the garlic and then cook, stirring just a few times, allowing the mushrooms to brown a bit while the brussels sprouts turn bright green and tender. Season with 1/2 teaspoon salt and 1/4 teaspoon pepper and toss to coat. Remove from the heat. Whisk together the eggs, cream, remaining salt and pepper. Add the cooked vegetables and the sausage to the egg mixture and stir to combine. Stir in the cheese. Pour into a 9-10" tart pan or a greased pie plate. Bake for 18-20 minutes, until the eggs have set and the top is lightly browned. Slice into wedges and serve warm. Enjoy! * I tend to use cream for my quiches, but all of the dairy options work fine. FREEZER MEAL: Let cool and then portion into freezer safe Ziplocs or resealable containers. 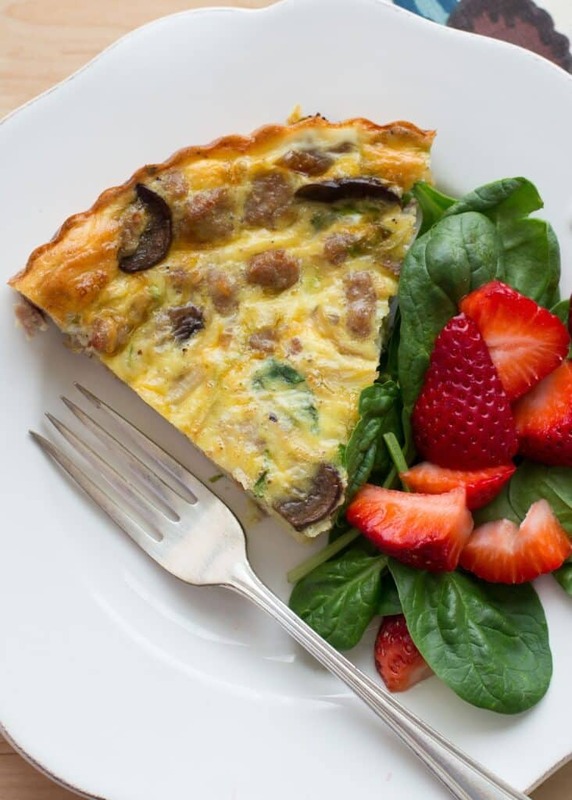 The quiche can be thawed in the refrigerator first or reheated in the microwave straight from the freezer. I'm not a big crust fan, so I make crustless pumpkin pie too. 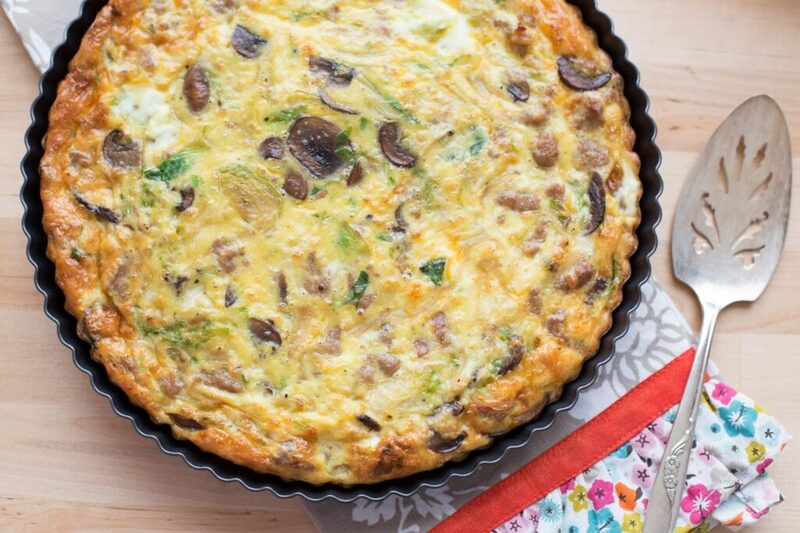 We call this frittata - and very nice combo this one is. What a lovely quiche. It's an awesome way to sneak in more vegetables in our meals. Thanks. Have been looking for new 'proportions'- thanks for yours!! Have been making 'crustless' tuna zucchini-Suisse- another great spring combination!! 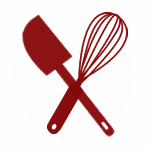 When you do add potatoes, how do you modify the recipe? You can add frozen hashbrowns and simply stir them into the eggs. You'll probably only need to add an additional 5-10 minutes for cooking time. I typically use leftover roasted potatoes (or I'll roast a tray just for breakfast) and you can stir them into the eggs or layer them in the bottom of the dish. When using roasted potatoes, you likely won't need to adjust the time by more than a few minutes for the thicker quiche. When it is golden brown and set, it's ready! Sunday morning breakfast solved! It has been snowing non-stop for two days here.. ugh..This will make us smile, I am sure.